Above is three-dimensional view of the Arctic Basin. The North Pole is in the vicinity of that large ridge the runs from Russia to Greenland. So when I learned about massive volcanic explosion at the bottom of the Arctic Sea, not too far distant in time from the recent loss of Arctic Ice mass, I realized there were MORE forces at work than simply solar energy and green house gases. The natural basin that is the Arctic Ocean is possibly the reason why Arctic water temperatures were rising because the warming caused by these massive underwater explosions couldn’t really circulate out of the basin. Is this the real culprit for why the ice and glaciers have been receding in the Arctic and ice as been growing in the Antarctic? Seems highly possible. A Russian-U.S. expedition comprising 28 scientists has, in its research of the Arctic seas, found powerful methane emissions in the northern sector of the Laptev and Bering seas. Expedition Chief Igor Semiletov says that ‘methane torches’ have been running up from the depth of the ocean with methane emitted into the air. Possibly, methane comes from the depth of the Earth crust, which is a sign of a strong seismic activity in this region, Semiletov said. The danger of methane releases triggered by seismic activity in the Arctic was described by Carana in Runaway Warming (2011a) and in Runaway Global Warming (2011b) and by Light (2011). The link between earthquake activity along the Arctic Gakkel Ridge with destabilization of the submarine Arctic methane hydrates and the release of giant plumes of methane to the atmosphere was highlighted by Light and Solana (2002). 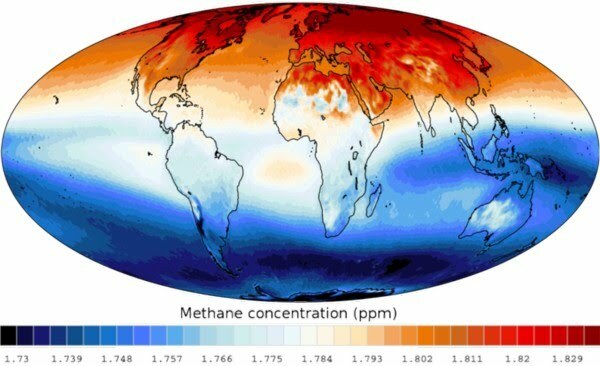 Methane is one of the most important greenhouse gases present in the atmosphere, having 20 times more warming potential than CO2 over a 100 yr period and 56 times more over a 20 yr period. It is hypothesized that this bias is driven by the desire to more accurately capture the observed recent acceleration of warming in the Arctic and corresponding decline in Arctic sea ice. However, this convergence is difficult to justify given the significant and widening discrepancy between the modeled and observed warming rates outside of the Arctic. Higher volcanic activity in these areas clearly cause more warm water to rise and heat the surface, creating the conditions for El Niño. Lower activity allows the cooler currents to dominate, bringing on La Niña. Long time scientists researching the phenomena claim the Trade Wind changes are the driver. I still think the fact is ocean temperature and currents would influence the winds more than the reverse. But I there is combined model that could work too. All systems have stability points. Under one set of conditions the system stabilizes to one condition, under others it stabilizes to a different one. All things equal (solar energy, water temp, wind and wave action) it is not implausible to see how adding a lot of under water heat energy (that rises and mixes with the surface waters at ever increasing surface area) could effect cloud formation, pressures and then winds. And then another year with less energy poured into the seas reverses the winds. It still seems more likely to me that the enormous thermal energy source under our thin crust would drive climate stronger than small changes in solar energy or CO2 levels. We are talking about thousands of kilometers of molten rock and iron, covered by a crustal boundary 100 or so kilometers thick. A boundary which has cracks and mission ocean ridges that vent a lot of energy into the oceans. A phenomena we know extremely little about. The Not to Scale drawing of the earth wedge view can be considered in this light to emphize how increadibly thin the crust actually is. Imagine holding a stack of copy paper consisting of 400 sheets. That thickness of paper represents the thickness of the Earth wedge or radius of the Earth. At that scale the Earth’s crust is one sheet thick under the oceans and up to four sheets thick under the continents. A lot of unknown material and activity exists in the Earth represented by the 396 to 399 sheets below the one to four sheets representing the crust.